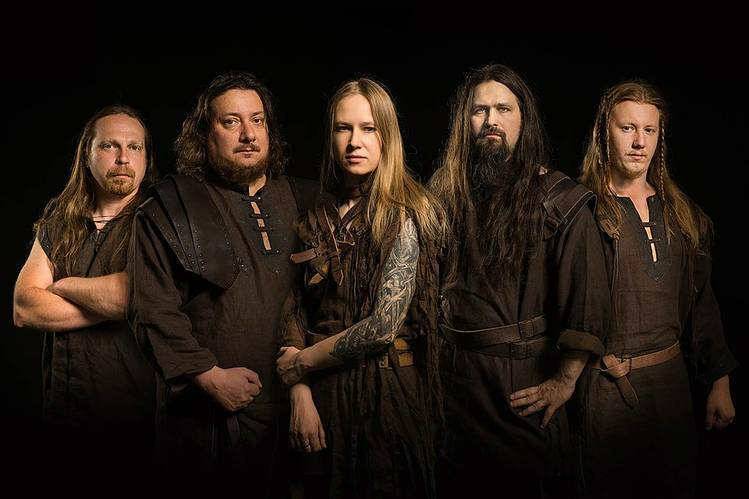 The beginnings of ARKONA date back to 2002, when members of local pagan community “Vyatichi”, Masha “Scream” Arhipova and Alexander “Warlock” Korolyov, decided to form a band that mirrored their individual philosophy and musical tastes. The band, at the time still known as Hyperborea, comprised Masha “Scream” Arhipova (vocals), Eugene Knyazev (guitar), Eugene Borzov (bass), Ilya Bogatyryov (guitar), Alexander “Warlock” Korolyov (drums), and Olga Loginova (keyboard), but it wasn’t until February 2002 that ARKONA surfaced from the depths of Russia’s underground scene. ARKONA soon decided to record several of their pagan/folk songs for their first demo. The recording took place at CDM-Records Studio in December 2002. The demo included 3 tracks – “Kolyada”, “Solntsevorot” (Solstice)” & “Rus’” (Russia). These tracks were later included as a bonus on the live album “Zhizn’ vo slavu” (Live for the Great) released in 2006. ARKONA began performing live in early 2003. Many concert-goers experienced the band for the first time at the Yazycheskaya Rus” Festival. By the summer of 2003, ARKONA was ready to record their debut, but disinterest in the band by some of its members saw the band disappear from the scene as quickly as it had arrived. Yet Masha’s perseverance would not subside. Continuing on her own, and with the help of the members of Nargathrond, she proceeded to compose new material. Her fellow musicians readied their instruments, read through the partitions, and without ever looking back, recorded their debut album “Vozrozhdenie” (Revival) in March 2004. “Vozrozhdenie” (Revival) quickly became one of the most successful Slavic pagan metal albums of all time. As soon as the studio work was completed, Masha dedicated herself to the creation of new songs and by the end of summer 2004, the material for the second album “Lepta” (The Contribution) was completed. With the support of the same line-up, the band finished the recordings in autumn. “Lepta” was released in December 2004 and presented the listener with a darker and gloomier style. ARKONA was also supported by poet and vocalist Les’yar (Nevid’, ex-Butterfly Temple), who not only performed, but also wrote the lyrics for “Zarnitsy Nashei.Svobody”. The album’s release placed ARKONA back on the scene as a contending force. With a complete line-up, ARKONA returned to the stages in the beginning of 2005. An ever-espousing fountain of creativity, Masha continued writing new material and by the summer of 2005, ARKONA was recording their next album. “Vo Slavu Velikim” (For the Glory of Great) proved to be the most complicated and varied album thus far, as the band withdrew from the use of synthesized sounds, replacing them with authentic folk instruments. As such, the list of guest musicians grew considerably including the renowned folk musician Vladimir Cherepovskiy (Mervent, ex- Voinstvo Sidov, Veter Vody, Trio Mario), as well as members of Svarga and Alkonost. Though the arrangements for each song at times exceeded 100 recorded tracks, ARKONA was able to finally piece together the album and “Vo Slavu Velikim!” (For the Glory of Great) was finally released in September 2005. During the touring that followed in support of the album’s release, ARKONA recorded their performance for the purpose of releasing a DVD and the live album “Zhizn’ vo Slavu”. Fueled by their outstanding achievements, ARKONA opted not to rest on its laurels and made sure to return with a new album as soon as possible. Fans heard a preview of “Ot Serdca K Nebu” (From the Heart to the Sky) at the 2008 Ragnarok Festival. In addition, the band embarked on a 30-day tour throughout Europe with Brutal Assault being just one of the highlights. Back at home, ARKONA decided not to take a break, but to immediately begin working on their fifth album. In order to top their previous effort, the band aimed to create something unique. While working on “Goi, Rode, Goi!”, the band also planned their second DVD. “Noch Velesova” was released via Napalm Records in May 2009. ARKONA also performed at the German festival Winternoise, taking a well-deserved break from the arduous recording process. Upon their return, ARKONA continued to work on the new album, completing the recordings in June 2009. It was quite an enterprise, as over 40 musicians were involved in the making of “Goi, Rode, Goi!”. The band described the process as the most labor-intensive and time-consuming work in its history. ARKONA made use of a full-fledged chorus and string quintet for the first time in their career. The heart of the album is undoubtedly the 15-minute saga ‘Na Moey Zemle’ that relates the adventures of a Slav in European countries. This epic features the voices of members of Manegarm, Menhir, and Heidevolk, among others. Vladimir Cherepovsky and Vladimir “Volk!, who has recently become a full-time member of ARKONA, are responsible for the traditional instruments on the album. The artwork was again the work of the legendary Kris Verwimp. He delivered a series of conceptual illustrations for each song on the album. The result was worth the hard work, as “Goi, Rode, Goi!“ proved to be the next logical step in the band’s journey. Fans would experience the live power of the new material at numerous live performances. ARKONA also produced video clips to the title track, the anthem “Yarilo”, as well as the melancholic “Liki Bessmertnykh Bogov“. The band played numerous shows in support of the new album and also released an EP in the summer of 2011 to ease the fans’ anticipatory wait for the upcoming album. The members of Arkona have already managed to make a name for themselves within the pagan metal scene that extends way beyond the borders of their native Russia. Their new album “Slovo” acknowledges their well-earned reputation with outstanding tracks. The band revolving around lead warrior Masha Scream has managed to outshine all past efforts. 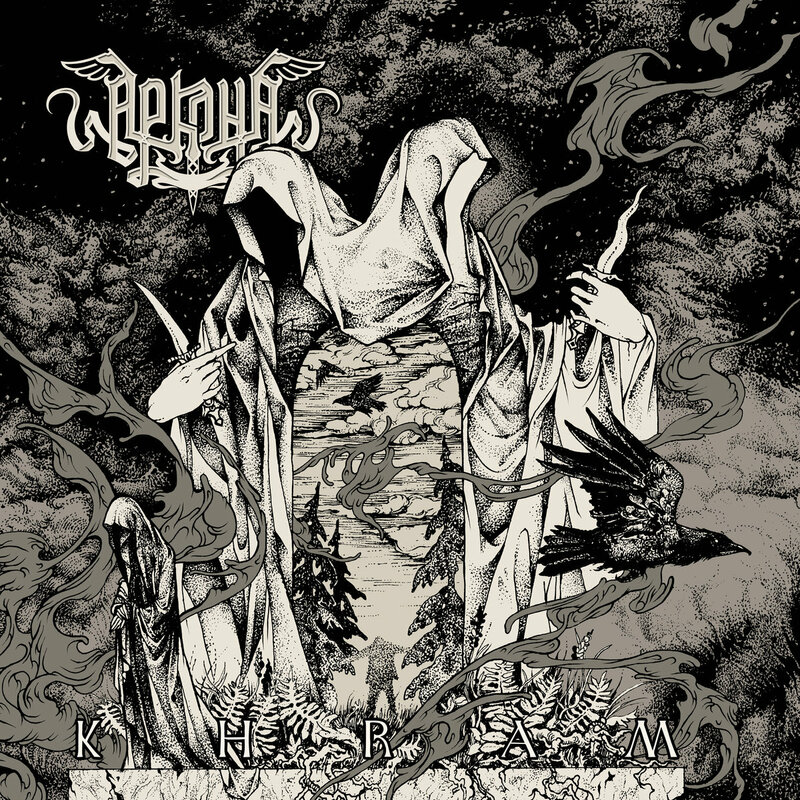 “Slovo” bundles Arkona’s strengths and catapults the band to new musical heights. The foundation of blast beats, double bass attacks, and heavy riffs remain, yet it is the attention to detail that rounds off Arkona’s multi-faceted sound. Folk melodies, complex vocal lines and choruses, clean vocals and growls, orchestral passages, and authentic instruments (violins, flutes, etc.) serve to embellish “Slovo”. The diversified end result features epic ballads and heavy folk-oriented tracks bound for certain glory at upcoming live performances. Masha’s Russian lyrics add a hardened, yet melancholic touch to this latest work. Once again, Arkona has chosen master illustrator Kris Verwimp (Vintersorg, Månegarm, Thyrfing, etc.) to design the album’s artwork. “Slovo” is an album full of highlights destined for yet another impressive victory on the pagan metal battlefield. Right after the release of the album “Slovo”, Arkona was participated in the Heidenfest tour 2011 across 11 countries in Europe. After that, the band discovered the North American continent : Arkona played 36 concerts in the U.S., Canada and Mexico. February 11th, 2012, in Moscow, the band was celebrated 10th anniversary with the biggest show history: a concert with the academic choir and string quartet . This performance was recorded and published a year later on a CD titled “Decade of Glory”. Arkona was played a long concert tour, dedicated to the 10th anniversary of the band , in Russia , Europe, North America (USA , Canada, Mexico ) and South America (Argentina and Brazil) , and also participated in many festivals , including 70,000 Tons of Metal. Anniversary tour included more than 100 performances. After returning from PaganFest tour in early 2013, Arkona started to prepare 7th studio album called “YAV”. Until June, musicians were in studio, working on the album. Recording was appointed for the end of month, but after performance at the festival “MetalFest” in Poland 22.06 Vlad «Artist» decided to leave the band. The group asked him to record the part of the material , which he learned before his decision and play with Arkona all upcoming concerts. The other songs were recorded by famous Russian musician Andrey Ishchenko. Later he became a permanent member of Arkona. “YAV” got the highest category of complexity of all recorded Arkona albums. Masha decided to not use choir and strings, and concentrate on her own vocal line and guitar parts. The album got a completely conceptual character and, unlike previous works, all the songs sounds in a dark and epic vein. In October 2013 Arkona took a break with the work on the album to go to the biggest tour in band’s history: first headlining tour in North America, headlining tour in South America, and finished with 11 European countries, touring as a special guest participant on tour with Therion.